The city of Kolkata is an incredible mosaic of the new and the old. 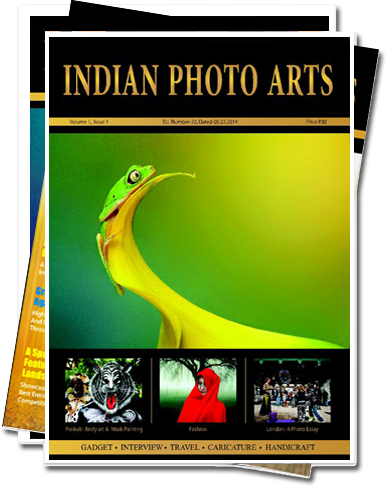 Keeping up with the spell of rapid modernisation taking place all over the country large neighbourhoods of the city decided to jump on to the bandwagon and metamorphosed into something which fits the description of a 21st century modern Indian city. This change is noticeable in the changing faces of the city’s architecture, with modern high-rises beginning to dominate the city’s skyline, luxurious shopping malls opening their doors to their customers bringing to them the top brands and amenities, eateries and restaurants opting for the much needed facelift in order to keep up with the changing exterior all around them, in other words the city has steadily dawned a glittery mantle well suited for the modern times. Then there are parts of the city which are still comfortably nestled in the old times, retaining that old world charm. These parts of the city have barely changed; it certainly seems the winds of change are yet to sweep into these corners of this great city. Such a neighbourhood is Chitpur, one of Kolkata’s oldest neighbourhoods. 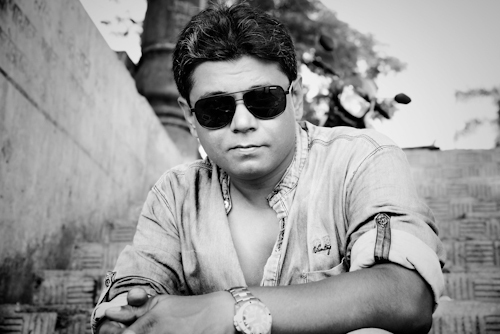 In fact Chitpur originally was not a part of the city. A rather curious sequence of events which included the timely intervention of a British surgeon which cured Mughal Emperor Farrukhsiyar’s chronic ailments followed by shrewd diplomatic policies imposed by the British led to the Mughal Emperor handing over Chitpur along with several other villages to the British. Today’s Chitpur is best known for housing the city’s largest and most prominent mosque Nakhoda Masjid. Still in its early days when compared to the neighbourhood which houses it, Nakhoda Masjid was built in 1926 by a shipping magnate belonging to the Kutchi Memon Jamat, a small community of Sunni Muslims from Kutch. Keeping in mind the shipping background of its patron the mosque was named “Nakhoda” meaning mariner. With a prayer hall capacity of 10,000 people and three domes and two minarets which are 151 feet high Nakhoda Msjid towers above the busy neighbourhood of Chitpur. For most part of the year the area around the mosque is dominated by the daily lives and activities of small to medium scale trades and businessmen who dominate the economy of this region. At first glance it is nothing short of a prolonged chaos which never seems to head towards a conclusion, yet somehow in the middle of this madness both and life and business find a way and have been doing so for decades. 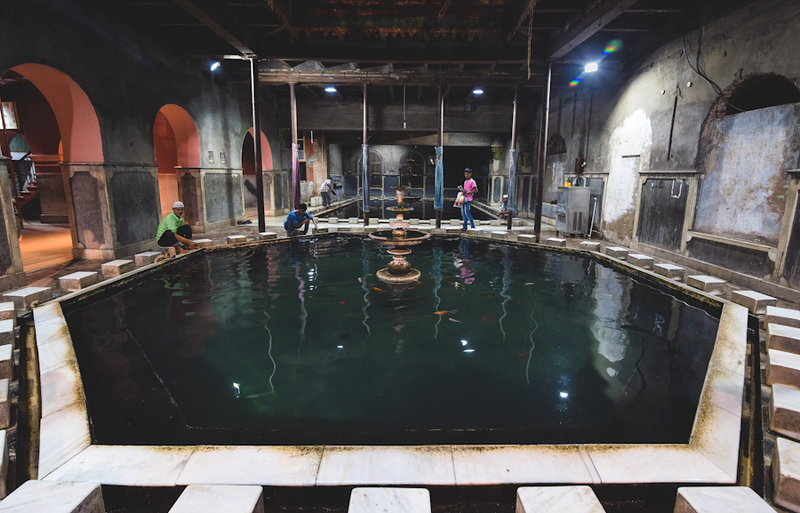 However there is one time of the year when the business dealings in the neighbourhood of Nakhoda Masjid take a back seat, making way for something more appealing to an average person with no interest in the mundane day to day affairs of business crunches. 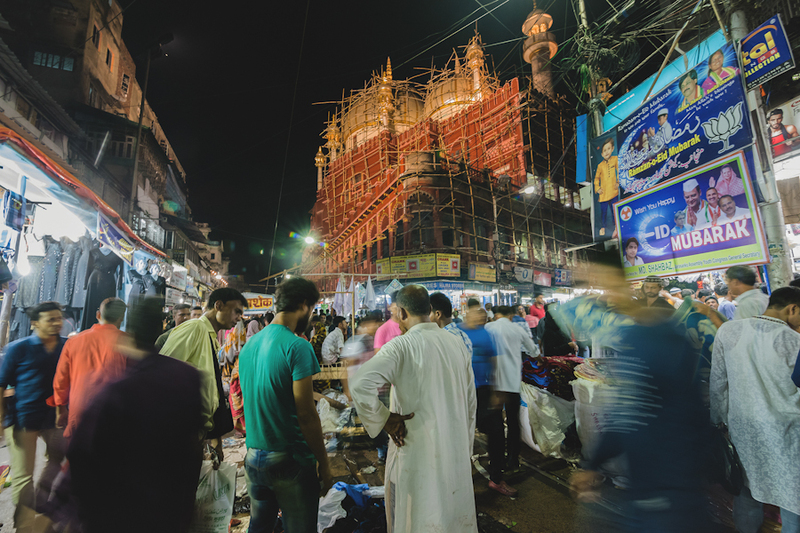 The maze of narrow lanes, the hustle and bustle of pedestrians, the screaming of the hawkers, vendors and traders, all these elements which define life in this part of the city make way for the spirit of celebration during Eid. 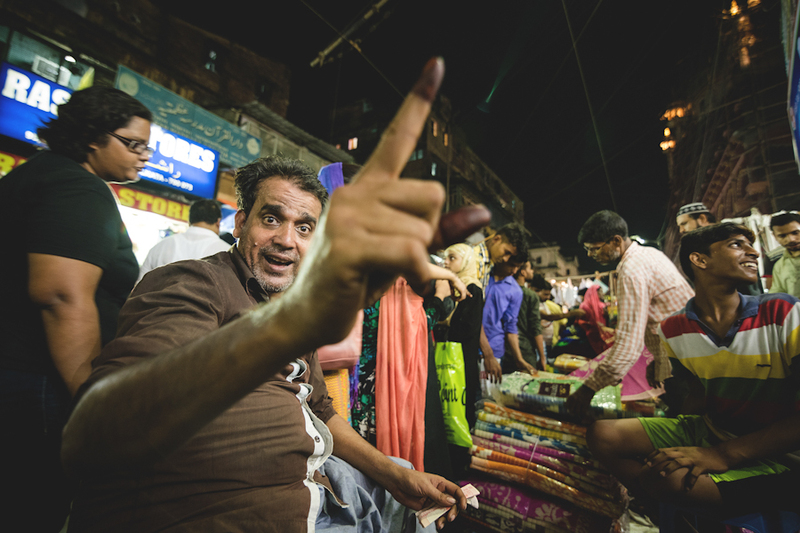 The adjoining Zakaria street market wraps up all its proceedings by midnight and trading and other activities come to a halt on the auspicious occasion of Eid. On the day of Eid thousands of people gather in front of this mosque and offer their prayers or namaz, the interior of the mosque is cleaned and everything is put into order for the prayers and celebrations due on the auspicious day of Eid. For a day at least this chaotic business neighbourhood of the city turns into a platform for celebrating brotherhood. 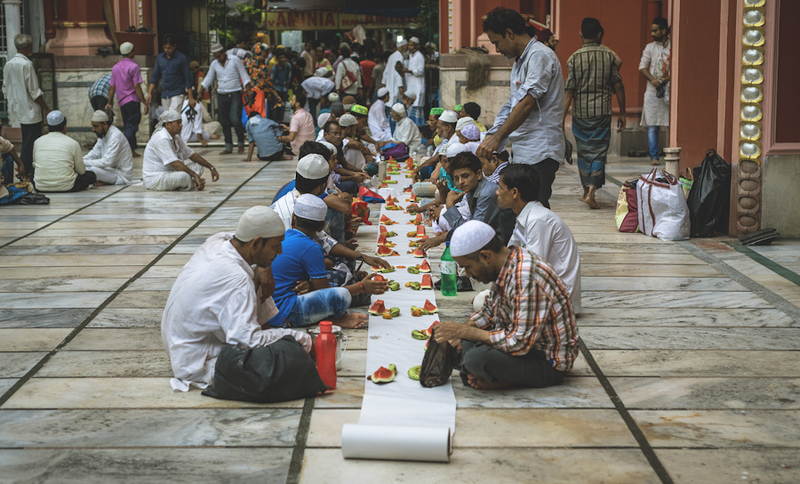 Members of the Muslim community belonging to all ages gather in huge numbers in their traditional attires to offer their prayers and gather around to observe Iftaar, during which they break their fast together inside the mosque premises. This is an ode to those celebrations of brotherhood, of kinship which strengthens and honours the existing bonds between and an iconic structure which still stands proudly and has still retained its relevance in the face of changing times. 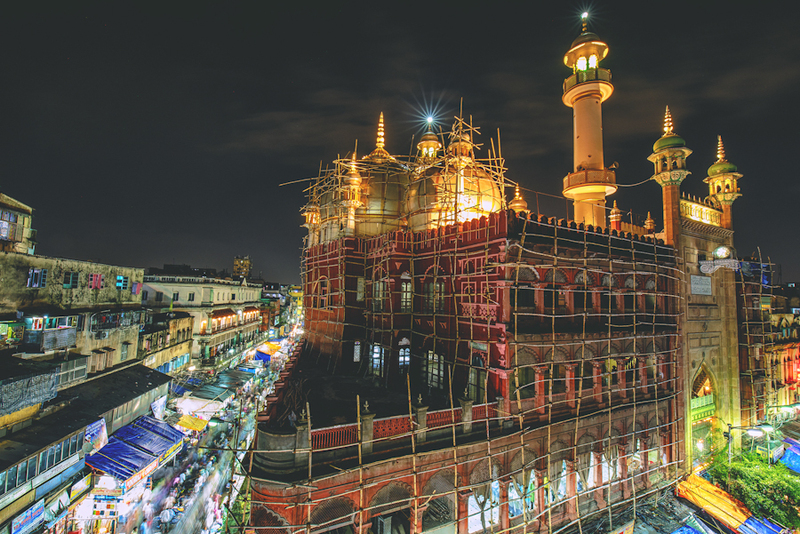 Nakhoda Masjid, in a way upholds the spirit intertwined with every fabric of the city, where the new doesn’t uproot the old, instead finds a way to co-exist and honour the old charm which is an integral part of this great city’s identity. 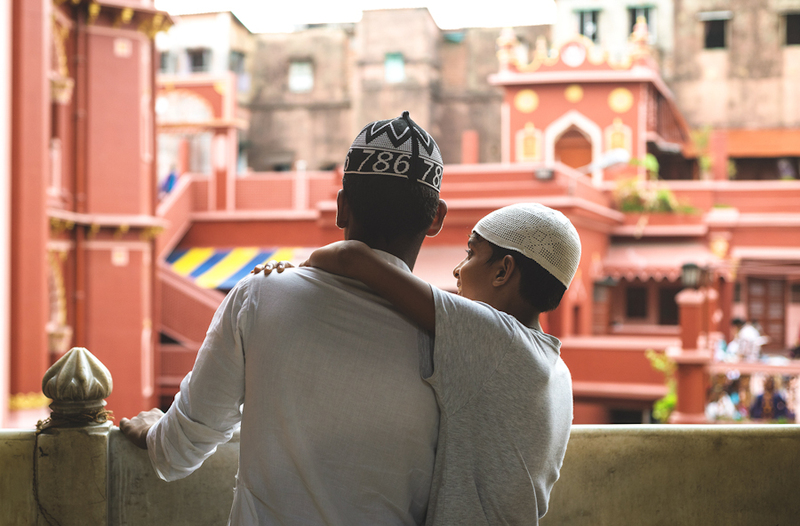 Nakhoda Masjid located in the old neighbourhood of Chitpur in Kolkata is going through a much needed facelift and renovation. The Zakaria Street market with the mosque in the background is a hotbed of activities as people indulge in last minute preparations for Eid. It is way past midnight, yet the adjoining market is full of activities, entertaining the last minute shoppers before Eid. 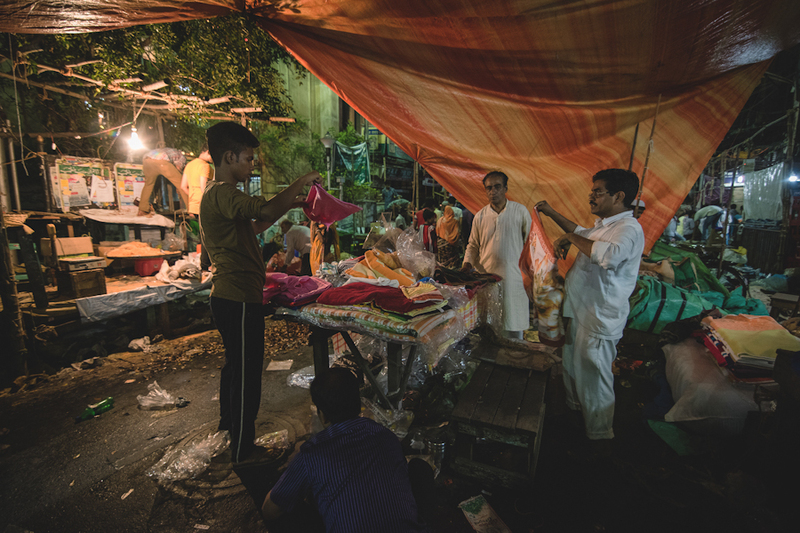 In the dying hours of night on the eve of Eid, these shopkeepers are busy dismantling their shops to make way for the early morning namaaz in front of Nakhoda Masjid. The traditional skull cap or “taqiah” is an integral part of the attire of a namazi. 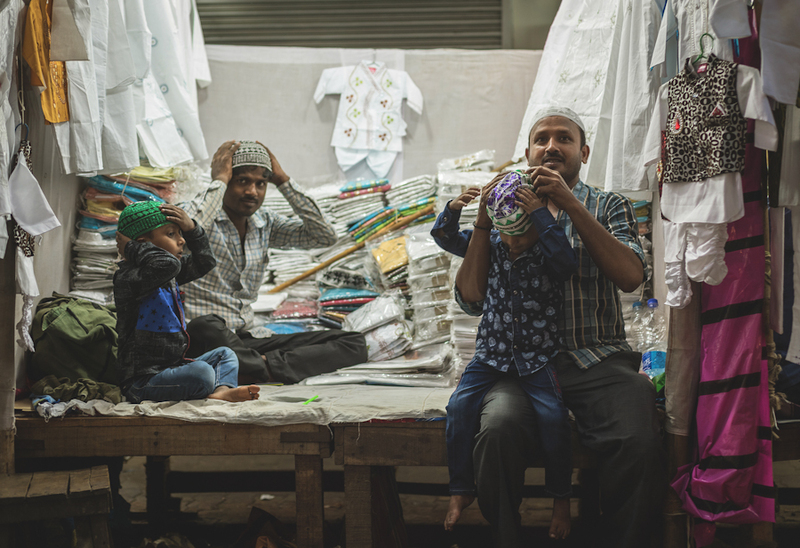 They come in all shapes and sizes and are available in stalls like this one on the neighbourhood of Nakhoda Masjid. The mosque premises are thoroughly cleaned on the night before Eid. 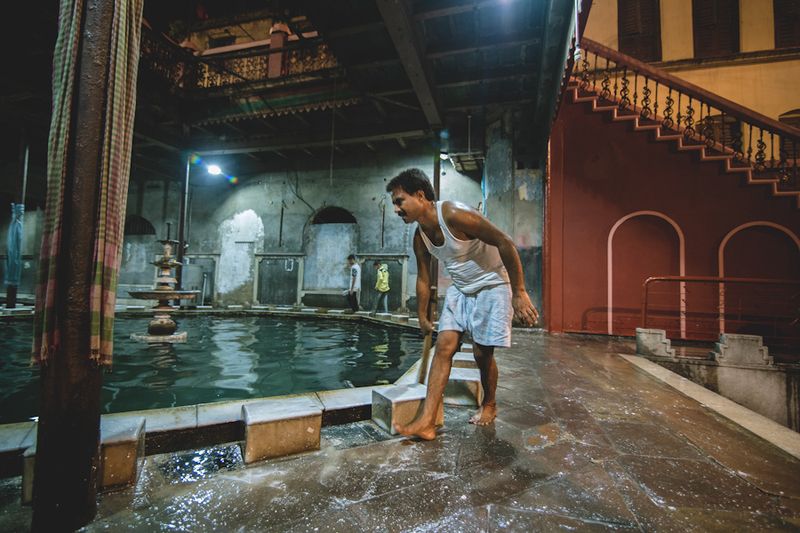 The pool of water inside the mosque or the kund area is meant for the worshippers who cleanse themselves before and after namaaz. 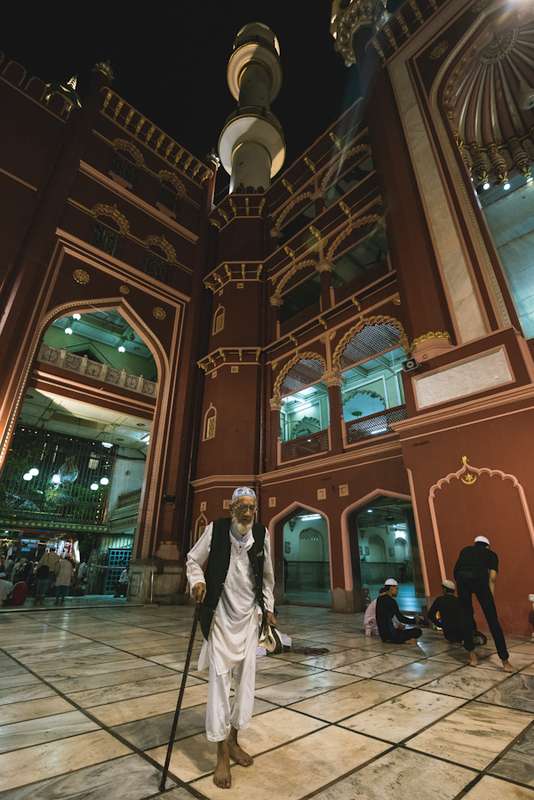 An elderly man entering the mosque premises during the early hours of the morning to offer his prayers. 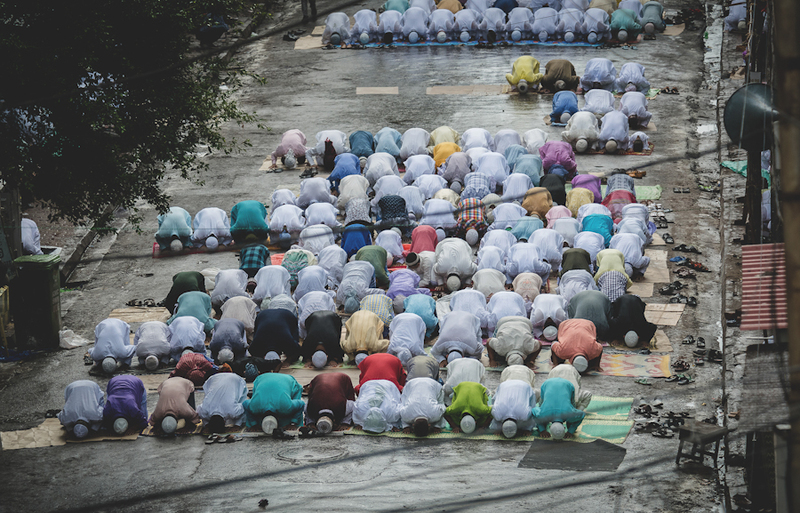 Thousands of worshippers offer their prayers on the morning of Eid in front of Nakhoda Masjid. A man applies “surma” or kohl to a fellow worshipper before namaaz. 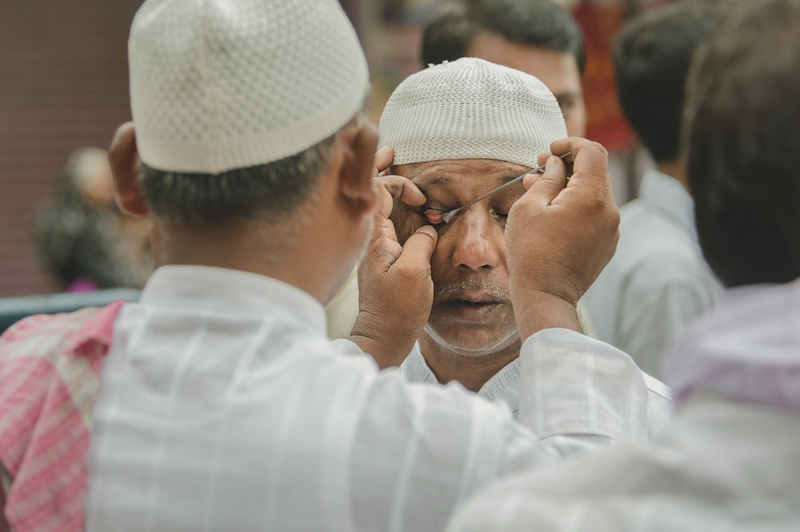 The applying surma is a common custom among the worshippers. These young boys are reading from the holy Quran inside Nakhoda Masjid on the morning of Eid. 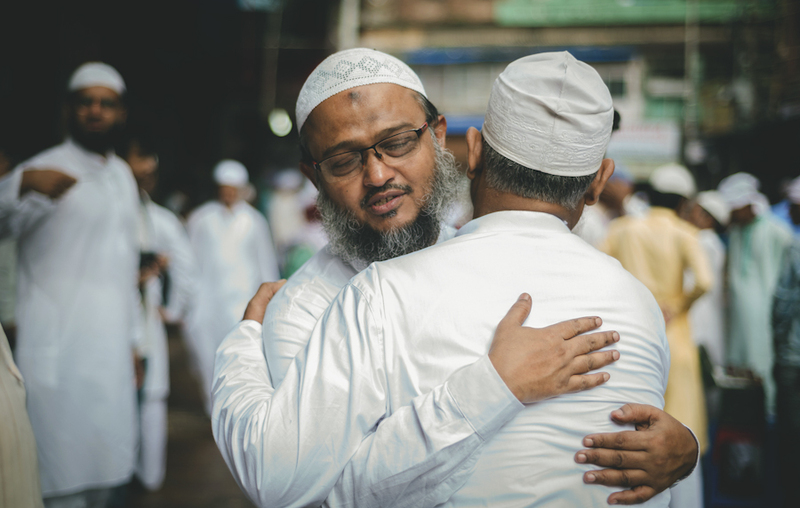 The morning namaaz on Eid is followed by exchange of greetings where the worshippers hug each other in a show of unity and kinship. 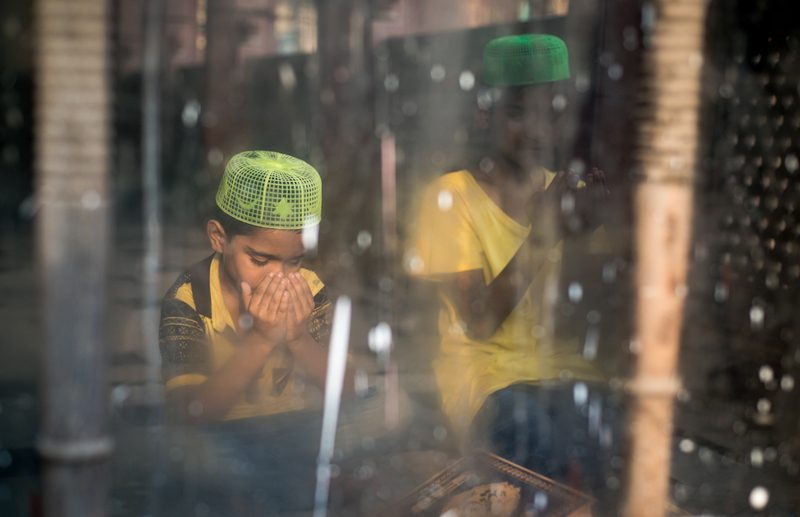 Worshippers gather in the mosque premises to observe Iftar, during which they break their day long fast which they observe during Ramadan. Eid is all about renewing old bonds and forging new ones.